[Old Sheets]Using the combination of Google Forms and the Autocrat Google Apps Script, teachers can save hours of time and still provide quality feedback to your students. Google has just created Add ons in Google Docs & Sheets which make installing and managing Autocrate easier. Here is the link to Jay Atwood's Autocrat add-on tutorial video. Create a Grading Scoring Guide using Google Forms. You can set this up in variety of ways: you can use standards based grading or use a numerical scale deciding how many points are assigned to each area you are evaluating. Using the Autocrat Google Apps Script created by +Andrew Stillman allows you to use the responses you placed in your Google Form to provide individualized feedback to your students on their assignments. You must have the e-mails/usernames of your students Google Apps for Education accounts. In this instance, you will use the Autocrat Google Apps Script very much like an mail merge. The Google Document Feedback template that will be used to create the individualized Google Documents with the information populated from your Google form when you graded their assignment. Provide your feedback in a different color than the rest of your document. This is done by changing the text color in your Google Document Feedback template information fields. Follow the formatting rules in the Autocrat process. Be sure to include the $ and matching case exactly for the information fields. Go in-depth with the leading artists and professionals working on stage today when you go Downstage Center. Downstage Center is the American Theatre Wing's acclaimed weekly theatrical interview program that spotlights the creative talents on Broadway, Off-Broadway, across the country and around the world, with in-depth conversations that simply can't be found anywhere else. I am enthralled by these fascinating conversations. The Educational Theatre Association and Utah State University partnered to conduct a survey assessing the state of theatre arts education in United States high schools. This month's Teaching Theatre Magazine is devoted to the results of the the survey. Please click the link below to view the digital copy of Teaching Theatre. Check out Kevin Brookhouser's YouTube video about Dramatic Irony in "The Scottish Play"
Kevin Brookhouser is a English teacher in California. He is a Google Certified Teacher and Google Apps for Education Certified Trainer. Be sure to watch and share Kevin's newest video project- Writing Felonies. Thank you Kevin for all you inspiring ideas for teachers and students. Dear Photograph Website- A resources for helping actors understand creating memories. I find as a Theatre teacher working with high school age actors, one of the hardest challenges is helping student create memories for their characters. Our students sometimes don't have that life experience to have a full understanding of what they need to portray on stage. I came across the Dear Photograph website and I found it moving and touching. It provides such a strong visual representation of memory and emotion. It could be a great place for student actors to go to for inspiration for their character past. The Diary of Anne Frank holds a special place in my heart as Theatre artist. It was the very first scene I ever directed, during my senior year of high school. I visited the Anne Frank House on a school tour of Europe when I was a senior in high school. I directed The Diary of Anne Frank at my school during my second year of teaching. There is so much hope, fear, tragedy, and essence of the human spirit in the play and diary. The Google Cultural Institute gives students detailed views of primary source artifacts about some of the most significant people and events of the 20th century. Google Cultural Institute states, "We have created this site to provide a visually rich and interactive online experience for telling cultural stories in new ways. Discover exhibits by expert curators, find artifacts, view photographs, read original manuscripts, watch videos, and more." I want my #GTAMTV! Fingers Crossed! Thank you again to Melissa Tackett. It is not often we get to hear our impact on students. Need your batteries recharged! Watch this inspiring keynote from the 2012 Educational Theatre Association from Richard Robichaux. National Coalition for CORE ARTS Standards- live update at 3:00 p.m. (EDT) on Wednesday, October 3. Dave Morris gives a great introduction to the improvisation process. Marci Liroff is a veteran casting director, located in Los Angeles, who has cast everything from E.T to Freaky Friday to Mr. Popper's Penguins and so much more. She is a casting director who has embraced the world of social media and is committed to helping actors put their best foot forward for auditions. These two videos are great resources to share with your students, she touches on things we have all said to our students. Be unique, bring yourself to the role, be professional, and how to recover from a mistake. After watching this video, I found using my Roku player. I realized that growth of social media has transformed the casting world. Be sure to check out her website and blog for practical tips for actors on how to navigate in new landscape of social media and the casting process. Start the video at 5:45. Unable to attend the Education Theatre Association's conference , now you can participate in part of the conference. The Educational Theatre Association will video stream two keynote presentations from the EdTA Conference in San Diego. The two streamed events take place on Saturday, September 22, 8:45 to 9:45 a.m. and 11:15 a.m. to 12:15 PST, atnew.livestream.com/edta. Both presentations will include a live chat option that will enable the online audience to pose questions to the presenters. The 8:45 keynote marks the premiere public presentation of the 2011-12 Educational Theatre Association-Utah State University Survey of Theatre Education in United States High Schools, by Dr. Matt Omasta, the first such report since EdTA’s 1991 survey . The 11:15 presentation features an update on the Next Generation Standards Project by EdTA theatre writing team members and leadership of theNational Coalition for Core Standards (NCCAS). EdTA, along the with seven other national arts and education organizations that comprise NCCAS, are rewriting the landmark 1994 National Arts Education Standards. I use the The Cutting Edge: The Magic of Movie Making with my Film Studies class. So you are planning your Chapter Thespian Festival, your board members live in 4 different parts of the state or province. You need to meet but you all have rehearsal and do not have the time to drive to meet together in one place. Trying using Google+ Hangouts. You can have up 10 people all meeting at the same time. I recently participated in a planing meeting for EdCamp St. Louis using Google Hangouts. It was quick and easy. Turn your desktop speakers off and use headphones with microphones so you don't get the echo effect from your desktop speakers. Careful of extraneous noises. Hangout switches who is on the large screen based on sound. If it is a new group of people who don't know each other have them install the lower 3rd app in Hangouts. This is my favorite one so far. A lot of practical tips and advice. Workshop starts at 9:00 minutes in. 135 Shots That Will Restore Your Faith in Cinema from Flavorwire on Vimeo. Here is the link with that list all the films as they appear on screen. Thank you to flavorwire.com for posting and Jim Sill of http://mistersill.com for tweeting this link yesterday. What a impressive collection of clips. Here is the latest workshop from YouTube Creators. Skip to 12:46 to start the actual workshop. http://www.youtube.com/afi- Great resource mentioned in the workshop. This Week, The New York Times' The Learning Network focused on how all teachers can use drama strategies in their classrooms using New York Times content and theatre techniques. 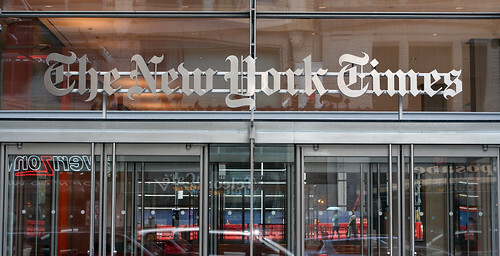 The Learning Network provides teaching and learning materials and ideas based on New York Times content. Visions of Light and Cinematographer's Style are two documentaries that give a detailed view of cinematography in the world of film. When ever I do my Ed Tech workshops for teachers, I call this my 5 dollar ed tech tip. Google Forms are life savers. Google Forms are always linked to a Google Spreadsheet. All the information entered into the Google Form will appear in the Google Spreadsheet. I am starting my 18th year of teaching, which means I have overseen the ordering of over 50 different show shirts in my career. Life became easier once I started using Google Forms, no more lost sheets of paper. I simple copy the embed code or if your website is a Google Site just click insert and show shirt available to order. You can also add more questions, if you needed to do an order for dance shoes and/or make-up kits. Another use for Google Forms creating a contact list for you productions. You can also customize your confirmation message. For this, one I reminded them the day the money was due. Here is links that can help you learn how to use forms. Theatrefolk understands the needs of Theatre teachers in the 21st century. Teachers are able to decide what format you would like the script- traditional book form or a downloadable pdf file. If you are producing the play then you can purchase the photocopy rights to distribute the script to the cast and crew. You can read the play now, so you don't have to wait a week for it to be delivered. I appreciate that Theatrefolk has chosen secure pdf as file format so it can be read on different readers not just an i-Pad. I encountered this problem with another publisher this summer in selecting my fall show. The playwright's website said read on your I-Pod, I-Pad or on your computer with I-Tunes. I do not own any Apple products and was not able to read the play after I had bought it. Theatrefolk offers more than just scripts, but other resources for Theatre teachers. Ever thought about teaching playwriting, they have two new resources that will help student create original scripts. Theatrefolk also is very adept at using social media on their website they have a blog with videos, a new podcast, and free stuff. Be sure to check them out. If you are organizing a Thespian Festival or a Theatre teacher conference, Theatrefolk presents great workshops that help teachers and students explore the playwriting process. 3rd workshop in 3 month series on video production. The Kennedy Center instituted ARTSEDGE in 1996 as its educational media arm, reaching out to schools, communities, individuals and families with printed materials, classroom support and Internet technologies. Check out their website ARTSEDGE. They offer many different resources for teachers of the arts. Create a Google Form to get feedback from your Chapter Festival Workshops. Use an url shorter, like http://goo.gl and then create a QR code to link them to the Google Form. Include the QR Code in the workshop signage and on a laminated card for the presenter to pass around for attendees scan with their mobile devices. You can create Forms that would cover the whole conference, each separate session or each individual workshop. All the data collected is place in to a Google Spreadsheet and you can use various tools included in Google spreadsheets to analyze your data. Watch this informative video about a great organization. I have been part about of EdTA for over 20 years once as Thespian and now as Theatre & Film teacher. The Educational Theatre Association (EdTA) is a national nonprofit organization with approximately 90,000 student and professional members. EdTA’s mission is shaping lives through theatre education by: honoring student achievement in theatre and enriching their theatre education experience; supporting teachers by providing professional development, networking opportunities, resources, and recognition; and influencing public opinion that theatre education is essential and builds life skills. EdTA operates the International Thespian Society (ITS), an honorary organization that has inducted more than two million theatre students since its founding in 1929. EdTA also publishes Dramatics, a monthly magazine for high school theatre students, and Teaching Theatre, a quarterly journal for theatre education professionals. This is the 2nd workshop presented by YouTube Creators. This workshop focuses on the video production process. They give some nice pointers. At 31:00 minutes, there are some technical difficulties and it ends abruptly. Watch for posts about some pre-production tools soon. Here is my Symbaloo Web Mix from my I-Create Web Camp I taught earlier this summer. Have fun enjoying these web tools that allow you and your students to be creative. Psykopaint was the favorite tool of the campers. Here is the Hangout On Air from the first in the series presented by YouTube Creators. This Hangout On Air give an overview of creating and using a YouTube channel to share your videos with your audience. This Wednesday July 25 they will start covering the pre-production process-Pre-visualization and Storyboarding add to calendar. YouTube Creator Blog: Upcoming educational workshops on Google Plus: We’re excited to tell you about upcoming workshops that will be on Google Plus Hangouts on Air every week until the beginning of October. These look to be very helpful to any Theatre and Film teacher who teaches the video production process. Thanks to Jim Sill @mistersill for tweeting about this series of workshops. Jim Sill has a lot of great resources on his website-Mr. Sill's Website you should check out. Over the years, I have installed many freeware/shareware programs to help me preview fonts. I even have a 3 inch binder somewhere that has printed font examples. I do not know how many times I have highlighted text in Microsoft Word and kept on switch font one by one to figure out what font to use. I find font choice so important when creating a poster and program for a show. The font you choose can convey what the show is about and hopefully entice audience members to attend. Wordmark.it is a website that allows you to preview the fonts that are installed on the computer you are using to access the website. The toolbar at the top of pages gives you many variables to help you select the right font for your poster and programs. The center box is where you can type customized text such as your show title. You can preview the font adjusting the following variables: positive or negative space, all caps, all lowercase, a mix of capital and lowercase letters, and font size. You can narrow down the fonts you are interested in using the filter. Matt Lundlam from LudlamDramatics.com has developed a new app that is available in the Apple App Store as well as the Google Play (Android) Market. It is only 99 cents. It includes 250 Character, 250 Place and 250 Event descriptions that are randomized to help create a situation for your students to improv. You can add to and edit the list of descriptions. Those of you attending the Thespian Festival this week, stop by check it out in the Lied Center. 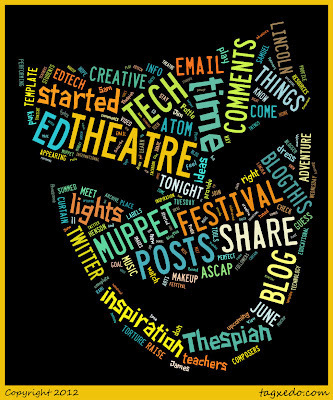 Theatre teachers search far and wide to find Ed Tech webinars focused specifically on Theatre. I was so excited when Google hosted their Education On Air Day this past April using Google +'s Hangouts On Air. Thank to Google for included this in their Education on Air day. Some of you may have seen Wordle.com used to create world clouds, well Tagxedo.com blows Wordle out of the water. Upload a script into Tagxedo and see what words and themes start to appear. Create the back of a show shirt with your ensemble members names in a shape that relates to your production. Follow this Google Docs link to see 101 Ways to use Tagxedo. TAGXEDO Logo example using the text from my blog posts. Lincoln Bound to International Thespian Festival! It time to put on make up! It time to light the lights! It's time to raise the curtain on the Muppet Show tonight. I feel the Muppets have summed up this upcoming week at the Thespian Festival and what I would like to do with blog. Check back often to see all the new posts that will start appearing throughout the week and after the Festival. 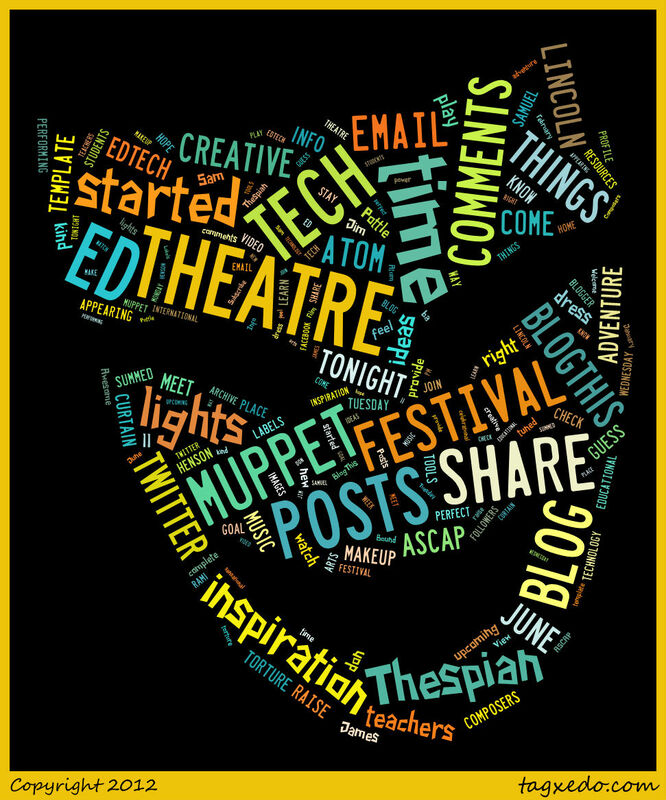 It is my goal for the blog to provide a place for Theatre, Film, and other teachers to find EdTech tools and ideas to inspire their students to be creative and learn. This video seemed to be the perfect way to start this adventure. Be Inspiring, Be Infectious, Be Creative! Come join me on this adventure!